A new WINTER OLYMPICS low. 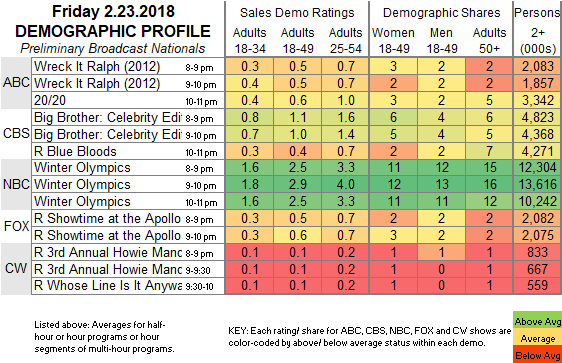 NBC: The WINTER OLYMPICS wasn’t gearing up for a big finish, dropping to its lowest preliminary rating yet at 2.6. That compared to 3.5 for the parallel night in 2014, 6.5 in 2010, 4.4 in 2006, and 9.5 in 2002. CBS: BIG BROTHER: CELEBRITY EDITION ticked up to 1.1 from last Friday, followed by 0.4 for a BLUE BLOODS rernn. ABC: After a run of the movie WRECK IT RALPH at 0.5, 20/20 was steady at 0.6. FOX: A SHOWTIME AT THE APOLLO rerun at 0.6. The Winter Olympics competition tonight is mainly sports, with the NBA on ABC and UFC on FOX, although HBO will premiere its Anna Deveare Smith special NOTES FROM THE FIELD. On Sunday, however, AMC will face off with the Closing Ceremony, kicking off the back half of THE WALKING DEAD’s season, and PBS’s VICTORIA airs its season finale.